The Julius Nyerere International Airport, which was formerly known as the Dar-es-Salaam International Airport is the principal airport serving Dar-es-Salaam, the largest city within the east African country of Tanzania. Located at a distance of 13 kilometers to the south-west of Dar-es-Salaam City, this public international airport is owned and operated by the Tanzania Airports Authority. Situated at an elevation of 196 feet above mean sea level, the Julius Nyerere International Airport is presently having three passenger terminals. Along with a couple of asphalt surfaced runways measuring 9,842 feet and 3,280 feet, the JNIA is however going through a massive expansion program. There is a partnership project underway between the Governments of Tanzania and China which will enable this airport to expand to Terminal Four, and make this airport to be east Africa’s largest airport with most modern facilities and amenities. Currently, this airport with help of 5 aero-bridges and the present infrastructure is sufficiently having a capacity to handle 1,500,000 passengers annually. The existing facilities at this airport include a post office, banks, currency exchange counters, business lounge, wireless internet connectivity, restaurants, bars, cafeteria, duty free shops, and a host of other stalls catering to passenger requirements. A Tourist help desk and car hire facilities are also available at this airport. There is sufficient parking space outside the terminal buildings where from shuttle bus services are also provided for passengers willing to travel downtown. Private taxis and hotel pick-up and drop services are conveniently available to and from the Julius Nyerere International Airport, which is looking forward to becoming a full fledged aviation hub of the east African region. 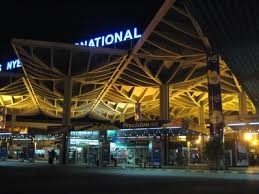 Here's the our members favorite photos of "Airports in Dar es Salaam". Upload your photo of Julius Nyerere International Airport! Connect with Victor Mwita, Randy Haglund and 6 other members who have already visited Julius Nyerere International Airport.